Polymer clay techniques for making beautiful crafts and jewelry items allow virtually unlimited possibilities for creative artists. Polymer clay is durable and affordable and comes in a wide range of colors, including metallic and pearlescent finishes. Its plasticity makes it easy to work with. If you are new to sculpting with polymer clay, you will want to start by learning a few basic techniques before moving on to advanced skills. Experiment with different brands of clay, like Sculpey and Fimo, and various types of polymer clay, such as metallic and translucent clays, to get familiar with how each clay reacts to mixing, sculpting, and baking. Some brands are more or less pliable than others, and some varieties are baked at different temperatures. Choosing your favorites to work with will ensure a greater level of success in your craft as you learn. You can find free polymer clay tutorials online and in your local craft shop for learning even the most advanced techniques, such a polymer clay canes. Simple shaping: All polymer clay requires a bit of warming and molding by hand to become pliable. Create a few shapes in different sizes and color blends and then bake them to finish so that you can learn more about your clay before moving on. Attaching pieces to each other: Experiment with attaching components together before baking. Polymer clay generally sticks to itself well, but where your pieces meet with minimal contact, you may want to try scratching a cross-hatched pattern into the areas to be joined before pressing them together. Alternatively, you can epoxy your connecting pieces together after baking. Make a small clay snowman to see how it holds together during the baking process. Blending and twisting colors together: Try mixing a variety of colors of clay to form beads by shaping and twisting them together. When you have a mix that satisfies you, sculpt a few beads and carefully push toothpicks or wires through them to form holes for stringing. Experiment with different gauges of piercings to find out which works best for the string that you prefer to use. Blending colors: The Skinner Blend is a technique that results in softly blended colors. It's best to have a pasta maker on hand for this, as well as a sharp knife. You should keep a separate pasta maker and other tools for modeling your clay and ensure that they are never used for food. 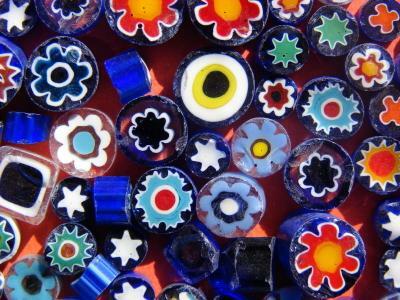 Polymer clay is made from plastics and dyes, and it is not safe to use food preparation items to handle your clay. Creating intricate designs with canes: Canes are layers and tubes of clay wrapped with additional layers of clay to create flowers and other designs. The completed canes can then be reduced by rolling to the desired size for your designs, then sliced into several matching layers for use as beads, buttons, or to layer over other items. Canes can be as simple as black-and-white stripes or as complex as simulated stained glass. Flower designs are probably the most frequently made canes, though geometrics are also popular. Faux effects: By mixing colors and types of clay, such as mixing metallic and transluscent clays to simulate opals, you can create nearly any time of faux finish that you desire. Moonstones are a popular faux effect, as are other gems, and metal and pearl effects allow you to create expensive looking jewelry at a fraction of the cost of the real thing. You will develop your own techniques as your skills develop. Polymer clay is nearly limitless in its potential, and if you experiment enough, you may end up developing a new technique that is named after you, just as Judith Skinner did with her Skinner Blend technique.